Research is beginning to explore the development of attention skills in children with Down syndrome and how these relate to later learning outcomes. 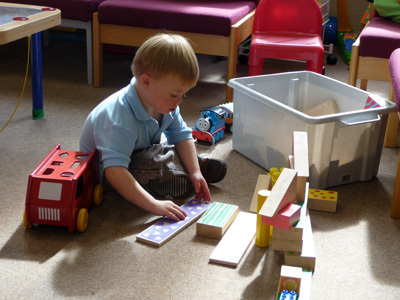 Initial findings suggest that supporting the development of attention skills in the early years could help to improve later language, literacy and number outcomes. In recent years the role of attention in children's learning has received increasing research interest and also the possibility that training in infancy may improve children's attention. 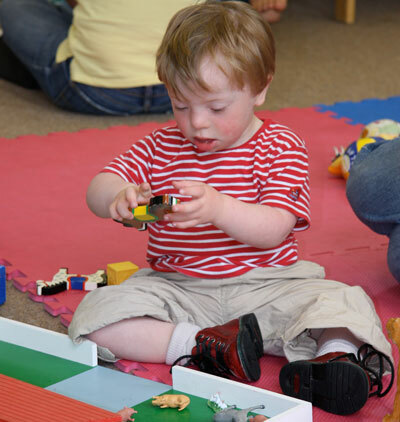 Research into the attention processes of children with Down syndrome (including work supported by DSE) is growing alongside the research with typically developing children and children with other genetically based disabilities such as William's syndrome and fragile X syndrome. The ability to concentrate and stay focussed on a task, to switch attention between tasks, and to inhibit impulsive responding are critical skills for early social and cognitive learning and subsequent academic outcomes. There are thought to be a number of attentional processes: including sustained attention or vigilance (maintaining attention on a task over time), selective attention (selecting input relevant to a task from other input) and executive attention - or shifting and dividing attention (controlling attention on the relevant input or responses while ignoring conflicting information). Researchers in the UK have begun to study attention in toddlers and school age children with Down syndrome to see what attention processes may predict progress in learning numeracy and literacy. Attention processes can be measured with questionnaire measures or experimental measures. In one study this research team used questionnaire measures and showed that children with Down syndrome (4-9 years) had higher levels of inattention than typically developing children matched for non-verbal mental age (therefore younger) but not higher levels of oppositional or hyperactive behaviours. They did have higher levels of all these behaviours than same age children, which is relevant for understanding behaviours in inclusive classroom situations. The children with Down syndrome had similar vocabulary comprehension to the non-verbal mental age group. On the reading measures they had better single word reading and letter knowledge and had similar rhyme awareness and phoneme matching abilities. Higher levels of inattentive behaviours were related to poorer performance on receptive vocabulary, single word reading, letter knowledge and rhyme matching but not phoneme matching. Overall, inattention has the same negative effect language and literacy progress for children with Down syndrome as for typically developing children. 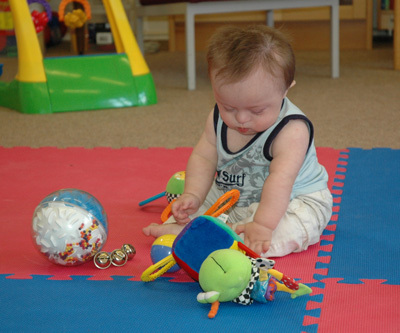 In another study, using experimental measures, this group have looked at younger children with Down syndrome (19 infants and toddlers, mean age 29 months). They reported that in comparison with mental-age matched typically developing toddlers those with Down syndrome showed similar orienting of attention but poorer sustained attention and longer looking times when looking at new items - this may be related to needing more time to process information. The toddlers with Down syndrome showed the same performance on a vocabulary task (looking at an object that did or did not match the name given) as the mental aged matched group but poorer performance on a numerosity task (looking at familiar or new number arrays). In a study of school age children (2, 3) the same group compared 26 children with Down syndrome (4 to 8 year olds) with groups of typically developing children providing a mental-age comparison and a literacy skills comparison. They used computerised tasks to measure sustained and selective attention processes and explored the links between attention and progress in reading and number over a year. On the sustained attention task the children with Down syndrome performed as well as the typically developing mental age comparison group but on the selective attention (visual search) task they were slower and made more errors. Individual differences are important as more errors on the selective attention (visual search) task were associated with lower scores on all the numeracy and literacy measures at time 1. Better selective attention was associated with more progress on numeracy across the following year and lower impulsivity on the sustained attention task with better word reading. There is an indication comparing the two studies that sustained attention may improve from infancy to school age for the children with Down syndrome. Another recent UK study of 5 - 14 year olds with Down syndrome using a standardised attention battery for children also reports that they performed relatively well for their mental age on sustained attention tasks but less well on aspects of selective attention and attentional control. These initial studies indicate that the attention profile of children with Down syndrome may show strengths and weaknesses and that attention processes are important in supporting children's language, literacy and number progress. This raises the question - what do we know about how attention processes develop and improve in early childhood and can we train them? Training attention in infancy and early childhood is currently a hot topic with some evidence that training may be effective[5, 6] and prominent researchers pointing out that if we intervene very early we may change the patterns of strengths and weaknesses seen later in children with disabilities. The training reviewed is experimental requiring children to engage in computer based tasks. It is also possible that everyday play and teaching tasks may be very effective in improving children's attention processes. This is a relatively new area of research that is beginning to inform thinking about approaches to early intervention and identifying important areas for future research. Steele, A., Brown, J. & Scerif, G. (2012) Integrating domain general and domain-specific developmental processes: cross syndrome, cross -domain comparisons. In E.K. Farran & A. Karmiloff-Smith (Eds.) Neurodevelopmental disorders across the life span. pp 339-36229, 36-49. Oxford University Press. Steel, A. (2011) Tracing syndrome-specific trajectories of cognitive development: the impact of attention profiles on precursors of literacy and numeracy. PhD Thesis University of Oxford, UK.